Burj Khalifa. The Shanghai Tower. One World Trade Center. Willis Tower. The Newby-McMahon Building? One of these things is not like the others. Standing a mere 40 feet tall, the Newby-McMahon Building in Wichita Falls, Texas, is absolutely dwarfed by actual building behemoths. But what the World’s Littlest Skyscraper lacks in size, it makes up for in story. In 1912, Wichita Falls was doing a big oil business—a gusher had been hit in the nearby town of Burkbennett, and thousands of people rushed to the area to stake a claim. One of them was a businessman named J.D. McMahon—but he wasn’t there to drill for oil. Instead, McMahon surveyed the town and realized it was sorely in need of a professional space where people could manage their oil dealings. He quickly drew up plans for a towering building worthy of the riches that were surely in Wichita Falls’ future. Despite the minor detail that he didn’t actually have permission to build on the property, McMahon managed to secure $200,000 ($2.7 million today) from investors. They were reportedly thrilled about the building’s prime location across the street from a bustling hotel and not far from the train depot. They weren’t so thrilled upon the building’s completion in 1919, when they realized they had invested in more of a tall tale than a tall tower. It seems that in the rush and excitement to capitalize on the boom town, no one bothered to check the dimensions of McMahon’s plans. By the time they figured out that it soared to the grand height of 480 inches instead of 480 feet, McMahon was long gone. What’s more, a judge ruled that the investors didn’t have a case, anyway—the blueprints were clearly labeled, and the financial backers should have reviewed them more carefully. That’s not to say the space went unused. Six oil companies rented desks in the building, which, in addition to being rather squatty, was just 10 feet by 16 2/3-feet wide. It also gained fame when Ripley’s Believe It Or Not! column deemed it “The World’s Littlest Skyscraper” in a 1920 cartoon. The oil boom fizzled out a few years later, however, and the small structure was abandoned. 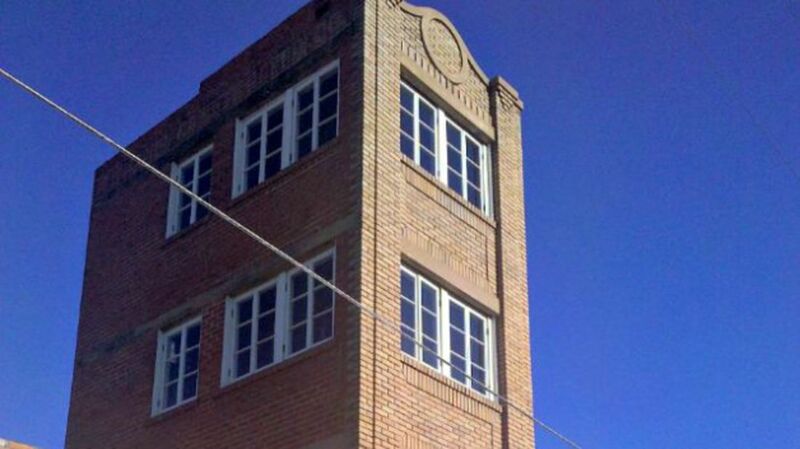 After a fire took it completely out of commission in 1931, the remains of the burned-out “skyscraper” served mostly as an embarrassing reminder of Wichita Falls’ once-grand aspirations. Though there were talks of demolishing the building, locals fought to have it saved, spending nearly $200,000 to purchase and restore all four stories. Their efforts paid off—the World’s Littlest Skyscraper was named to the National Historic Register and still stands today, housing an antique shop and an art studio.